DIE Lunæ, 17 die Decembris. Bp. of Hereford, Leave to be absent. Message from thence, for a Conference about the Canary Company's Patent. 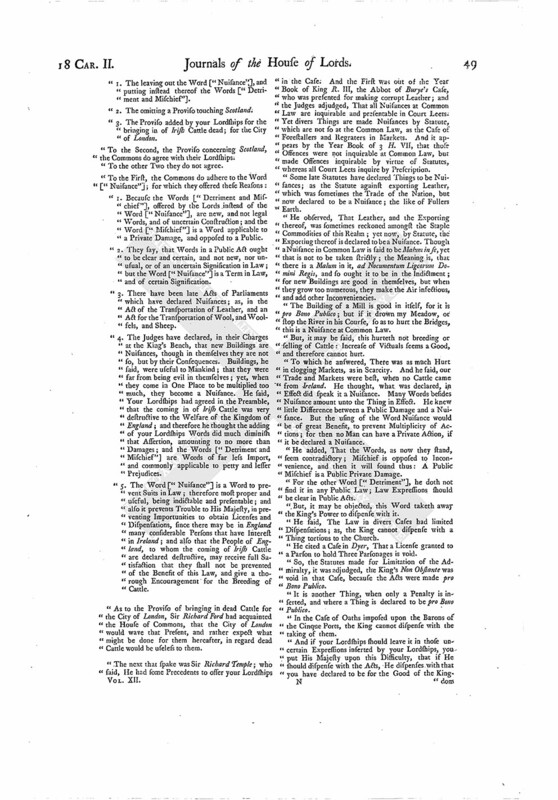 Committee to draw Reasons in Answer to H. C.
The Lord Bishop of Hereford had Leave to go into the Country; having Leave of His Majesty, and sent his Proxy. Hodie 2a vice lecta est Billa, "An Act for improving the Lead Mines in the County Palatine of Durham, granted to Humphrey Wharton Esquire for Three Lives." ORDERED, That the Committee for the Bill for uniting Churches in the Town of South'ton shall meet To-morrow Morning, at Nine of the Clock. 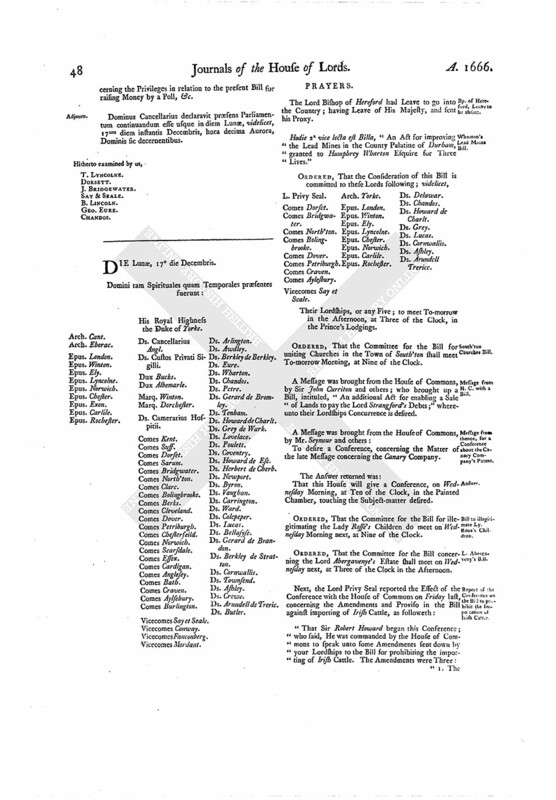 A Message was brought from the House of Commons, by Sir John Currition and others; who brought up a Bill, intituled, "An additional Act for enabling a Sale of Lands to pay the Lord Strangford's Debts;" whereunto their Lordships Concurrence is desired. To desire a Conference, concerning the Matter of the late Message concerning the Canary Company. That this House will give a Conference, on Wednesday Morning, at Ten of the Clock, in the Painted Chamber, touching the Subject-matter desired. ORDERED, That the Committee for the Bill for illegitimating the Lady Rosse's Children do meet on Wednesday Morning next, at Nine of the Clock. ORDERED, That the Committee for the Bill concerning the Lord Abergavenye's Estate shall meet on Wednesday next, at Three of the Clock in the Afternoon. "1. The leaving out the Word ["Nuisance"], and putting instead thereof the Words ["Detriment and Mischief"]. "2. The omitting a Proviso touching Scotland. "3. The Proviso added by your Lordships for the bringing in of Irish Cattle dead; for the City of London. "To the Second, the Proviso concerning Scotland, the Commons do agree with their Lordships. "To the other Two they do not agree. "1. Because the Words ["Detriment and Mischief"], offered by the Lords instead of the Word ["Nuisance"], are new, and not legal Words, and of uncertain Construction; and the Word ["Mischief"] is a Word applicable to a Private Damage, and opposed to a Public. "2. They say, that Words in a Public Act ought to be clear and certain, and not new, nor unusual, or of an uncertain Signification in Law; but the Word ["Nuisance"] is a Term in Law, and of certain Signification. "3. There have been late Acts of Parliaments which have declared Nuisances; as, in the Act of the Transportation of Leather, and an Act for the Transportation of Wool, and Woolfels, and Sheep. "4. The Judges have declared, in their Charges at the King's Bench, that new Buildings are Nuisances, though in themselves they are not so, but by their Consequences. Buildings, he said, were useful to Mankind; that they were far from being evil in themselves; yet, when they come in One Place to be multiplied too much, they become a Nuisance. He said, Your Lordships had agreed in the Preamble, that the coming in of Irish Cattle was very destructive to the Welfare of the Kingdom of England; and therefore he thought the adding of your Lordships Words did much diminish that Assertion, amounting to no more than Damages; and the Words ["Detriment and Mischief"] are Words of far less Import, and commonly applicable to petty and lesser Prejudices. "5. 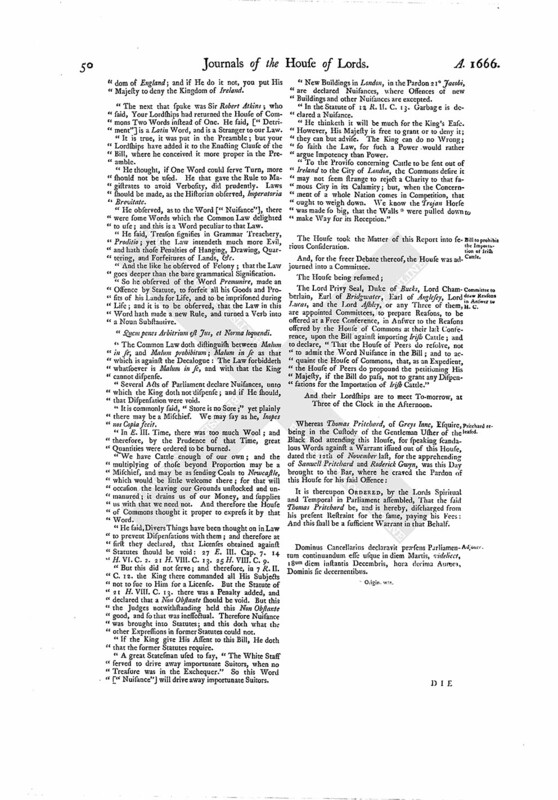 The Word ["Nuisance"] is a Word to prevent Suits in Law; therefore most proper and useful, being indictable and presentable; and also it prevents Trouble to His Majesty, in preventing Importunities to obtain Licenses and Dispensations, since there may be in England many considerable Persons that have Interest in Ireland; and also that the People of England, to whom the coming of Irish Cattle are declared destructive, may receive full Satisfaction that they shall not be prevented of the Benefit of this Law, and give a thorough Encouragement for the Breeding of Cattle. "As to the Proviso of bringing in dead Cattle for the City of London, Sir Richard Ford had acquainted the House of Commons, that the City of London would wave that Present, and rather expect what might be done for them hereafter, in regard dead Cattle would be useless to them. "The next that spake was Sir Richard Temple; who said, He had some Precedents to offer your Lordships in the Case. And the First was out of the Year Book of King R. III, the Abbot of Burye's Case, who was presented for making corrupt Leather; and the Judges adjudged, That all Nuisances at Common Law are inquirable and presentable in Court Leets. Yet divers Things are made Nuisances by Statute, which are not so at the Common Law, as the Case of Forestallers and Regraters in Markets. And it appears by the Year Book of 3 H. VII, that those Offences were not inquirable at Common Law, but made Offences inquirable by virtue of Statutes, whereas all Court Leets inquire by Prescription. "Some late Statutes have declared Things to be Nuisances; as the Statute against exporting Leather, which was sometimes the Trade of the Nation, but now declared to be a Nuisance; the like of Fullers Earth. "He observed, That Leather, and the Exporting thereof, was sometimes reckoned amongst the Staple Commodities of this Realm; yet now, by Statute, the Exporting thereof is declared to be a Nuisance. Though a Nuisance in Common Law is said to be Malum in se, yet that is not to be taken strictly; the Meaning is, that there is a Malum in it, ad Nocumentum Ligcorum Domini Regis, and so ought it to be in the Indictment; for new Buildings are good in themselves, but when they grow too numerous, they make the Air infectious, and add other Inconveniencies. "The Building of a Mill is good in itself, for it is pro Bono Publico; but if it drown my Meadow, or stop the River in his Course, so as to hurt the Bridges, this is a Nuisance at Common Law. "But, it may be said, this hurteth not breeding or selling of Cattle: Increase of Victuals seems a Good, and therefore cannot hurt. "To which he answered, There was as much Hurt in clogging Markets, as in Scarcity. And he said, our Trade and Markets were best, when no Cattle came from Ireland. He thought, what was declared, in Effect did speak it a Nuisance. Many Words besides Nuisance amount unto the Thing in Effect. He knew little Difference between a Public Damage and a Nuisance. But the using of the Word Nuisance would be of great Benefit, to prevent Multiplicity of Actions; for then no Man can have a Private Action, if it be declared a Nuisance. "He added, That the Words, as now they stand, seem contradictory; Mischief is opposed to Inconvenience, and then it will sound thus: A Public Mischief is a Public Private Damage. "For the other Word ["Detriment"], he doth not find it in any Public Law; Law Expressions should be clear in Public Acts. "But, it may be objected, this Word taketh away the King's Power to dispense with it. "He said, The Law in divers Cases had limited Dispensations; as, the King cannot dispense with a Thing tortious to the Church. "He cited a Case in Dyer, That a License granted to a Parson to hold Three Parsonages is void. "So, the Statutes made for Limitation of the Admiralty, it was adjudged, the King's Non Obstante was void in that Case, because the Acts were made pro Bono Publico. "It is another Thing, when only a Penalty is inserted, and where a Thing is declared to be pro Bono Publico. "In the Case of Oaths imposed upon the Barons of the Cinque Ports, the King cannot dispense with the taking of them. "And if your Lordships should leave it in those uncertain Expressions inserted by your Lordships, you put His Majesty upon this Difficulty, that if He should dispense with the Acts, He dispenses with that you have declared to be for the Good of the Kingdom of England; and if He do it not, you put His Majesty to deny the Kingdom of Ireland. "The next that spake was Sir Robert Atkins; who said, Your Lordships had returned the House of Commons Two Words instead of One. He said, ["Detriment"] is a Latin Word, and is a Stranger to our Law. "It is true, it was put in the Preamble; but your Lordships have added it to the Enacting Clause of the Bill, where he conceived it more proper in the Preamble. "He thought, if One Word could serve Turn, more should not be used. He that gave the Rule to Magistrates to avoid Verbosity, did prudently. Laws should be made, as the Historian observed, Imperatoria Brevitate. "He observed, as to the Word ["Nuisance"], there were some Words which the Common Law delighted to use; and this is a Word peculiar to that Law. "He said, Treason signifies in Grammar Treachery, Proditio; yet the Law intendeth much more Evil, and hath those Penalties of Hanging, Drawing, Quartering, and Forfeitures of Lands, &c.
"And the like he observed of Felony; that the Law goes deeper than the bare grammatical Signification. "So he observed of the Word Premunire, made an Offence by Statute, to forfeit all his Goods and Profits of his Lands for Life, and to be imprisoned during Life; and it is to be observed, that the Law in this Word hath made a new Rule, and turned a Verb into a Noun Substantive. Quem penes Arbitrium est Jus, et Norma loquendi. "The Common Law doth distinguish between Malum in se, and Malum prohibitum; Malum in se as that which is against the Decalogue: The Law forbiddeth whatsoever is Malum in sc, and with that the King cannot dispense. "Several Acts of Parliament declare Nuisances, unto which the King doth not dispense; and if He should, that Dispensation were void. "It is commonly said, "Store is no Sore;" yet plainly there may be a Mischief. We may say as he, Inopes nos Copia fecit. "In E. III. Time, there was too much Wool; and therefore, by the Prudence of that Time, great Quantities were ordered to be burned. "We have Cattle enough of our own; and the multiplying of those beyond Proportion may be a Mischief, and may be as sending Coals to Newcastle, which would be little welcome there; for that will occasion the leaving our Grounds unstocked and unmanured; it drains us of our Money, and supplies us with that we need not. And therefore the House of Commons thought it proper to express it by that Word. "He said, Divers Things have been thought on in Law to prevent Dispensations with them; and therefore at first they declared, that Licenses obtained against Statutes should be void: 27 E. III. Cap. 7. 14 H. VI. C. 2. 21 H. VIII. C. 13. 25 H. VIII. C. 9. "But this did not serve; and therefore, in 7 R. II. C. 12. the King there commanded all His Subjects not to sue to Him for a License. But the Statute of 21 H. VIII. C. 13. there was a Penalty added, and declared that a Non Obstante should be void. But this the Judges notwithstanding held this Non Obstante good, and so that was ineffectual. Therefore Nuisance was brought into Statutes; and this doth what the other Expressions in former Statutes could not. "If the King give His Assent to this Bill, He doth that the former Statutes require. "A great Statesman used to say, "The White Staff served to drive away importunate Suitors, when no Treasure was in the Exchequer." So this Word ["Nuisance"] will drive away importunate Suitors. "New Buildings in London, in the Pardon 21° Jacobi, are declared Nuisances, where Offences of new Buildings and other Nuisances are excepted. "In the Statute of 12 R. II. C. 13. Garbage is declared a Nuisance. "He thinketh it will be much for the King's Ease. However, His Majesty is free to grant or to deny it; they can but advise. The King can do no Wrong; so saith the Law, for such a Power would rather argue Impotency than Power. "To the Proviso concerning Cattle to be sent out of Ireland to the City of London, the Commons desire it may not seem strange to reject a Charity to that famous City in its Calamity; but, when the Concernment of a whole Nation comes in Competition, that ought to weigh down. We know the Trojan Horse was made so big, that the Walls (fn. 1) were pulled down to make Way for its Reception." The House took the Matter of this Report into serious Consideration. And, for the freer Debate thereof, the House was adjourned into a Committee. The Lord Privy Seal, Duke of Bucks, Lord Chamberlain, Earl of Bridgwater, Earl of Anglesey, Lord Lucas, and the Lord Ashley, or any Three of them, are appointed Committees, to prepare Reasons, to be offered at a Free Conference, in Answer to the Reasons offered by the House of Commons at their last Conference, upon the Bill against importing Irish Cattle; and to declare, "That the House of Peers do resolve, not to admit the Word Nuisance in the Bill; and to acquaint the House of Commons, that, as an Expedient, the House of Peers do propound the petitioning His Majesty, if the Bill do pass, not to grant any Dispensations for the Importation of Irish Cattle." And their Lordships are to meet To-morrow, at Three of the Clock in the Afternoon. It is thereupon ORDERED, by the Lords Spiritual and Temporal in Parliament assembled, That the said Thomas Pritchard be, and is hereby, discharged from his present Restraint for the same, paying his Fees: And this shall be a sufficient Warrant in that Behalf. Dominus Cancellarius declaravit præsens Parliamentum continuandum esse usque in diem Martis, videlicet, 18um diem instantis Decembris, hora decima Aurora, Dominis sic decernentibus.